Write a program that plots a Sierpinski triangle, as illustrated below. Then, develop a program that plots a recursive pattern of your own design. Part 1. The Sierpinski triangle is another example of a fractal pattern like the H-tree pattern from Section 2.3 of the textbook. The Polish mathematician Wacław Sierpiński described the pattern in 1915, but it has appeared in Italian art since the 13th century. Though the Sierpinski triangle looks complex, it can be generated with a short recursive program. Your task is to write a program Sierpinski.java with a recursive function sierpinski() and a main() function that calls the recursive function once, and plots the result using standard drawing. 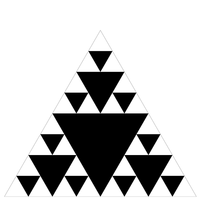 Think recursively: sierpinski() should draw one filled equilateral triangle (pointed downwards) and then call itself recursively three (3) times (with an appropriate stopping condition). When writing your program, exercise modular design: include a (non-recursive) function filledTriangle() that draws a filled equilateral triangle of a specified size at a specified location. Your program shall take one integer command-line argument N, to control the depth of the recursion. All of the drawing should fit snugly inside the equilateral triangle with endpoints (0, 0), (1, 0), and (1/2, √3/2). Do NOT change the scale of the drawing window. First, make sure that your program draws a single filled equilateral triangle when N equals 1. 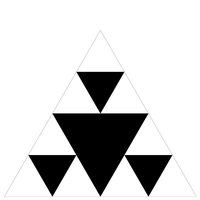 Then, check that it draws four filled equilateral triangles when N equals 2. Your program will be nearly (or completely) debugged when you get to this point. Below are the target Sierpinski triangles for different values of N.
the dimension of a square is two, and the dimension of a cube is three. can we express what it means mathematically or computationally? a number of self-similar pieces of smaller size. log (# self similar pieces) / log (scaling factor in each spatial direction). each of side length 1/5. the scaling factor is 2 (or 5). log (4) / log(2) = log (25) / log (5) = 2. Therefore, the dimension of a cube is log(8) / log (2) = log(125) / log(5) = 3.
each of side length 1/2. 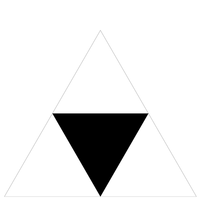 Thus, the dimension of a Sierpinski triangle is log (3) / log (2) ≈ 1.585. Its dimension is fractional—more than a line segment, but less than a square! with fractal geometry, it can be something in between. produces a recursive drawing of your own design. that controls the depth of recursion. It should stay within the drawing window when N is between 1 and 7.
that takes advantage of recursive functions. Submit Sierpinski.java and Art.java. Do not add sound to either file. If your Art.java requires any supplementary image files, submit them as well. file and answer the questions therein.